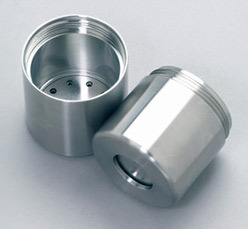 Rochester Manufacturing is a precision machining job shop for metal or plastic parts requiring tight tolerances. In this shop, problem-solving is part of the job—and our solutions always seek to add value to your part. Rochester Manufacturing offers expertise in difficult-to-machine materials often used in critical parts such as fluid power components, medical device components, and industrial equipment and hydraulic components. We offer developmental assistance from prototyping to commercial manufacturing of small to medium-sized lots, including reverse engineering of undocumented components. We also provide secondary operations including precision electrolytic deburring and outsourced operations such as plating, heat treating and anodizing. A company in Chicago contacted Rochester Manufacturing for assistance in developing a disposable container for shipping radioactive pellets used to treat prostate cancer. The lead container they were using was dirty to handle and created a costly toxic waste documentation stream. Working together for nearly a year, Rochester Manufacturing was able to develop a stainless steel container that was secure, easy to open, disposable, easy to sterilize, reduced radiation exposure for the medical staff and is uniquely attractive, creating a positive branding identity.